I started my first web hosting with Xoom in 90s and then Geocities. They are both free hosting services. Thanks to hosting company like Lunarpages and Exabytes, I able to afford my own cpanel hosting at reasonable fee as low as RM300 annually. 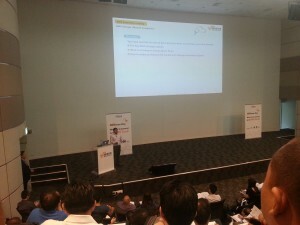 I even subscribed for a reseller plan so I can host multiples sites under one WHM. Now, I am more keen to use cloud services such as Heroku, AWS, Azure and Google Hosting. My recent favorite cloud provider is Digital Ocean. I had tried both Heroku and AWS and they are all charge like utilities bill base on usage, which can be very expensive for my free project. Digital Ocean offered fixed price and somehow I feel the vm are more stable than AWS Ec2 although Amazon S3 are still my all time favorite when come to storing static files. With emerging trend like dns cloudflare, baas parse.com, smtp mandrill… it seems that all infrastructure can be provided as service base (IaaS) and programmer can more focus on coding than setting up server. 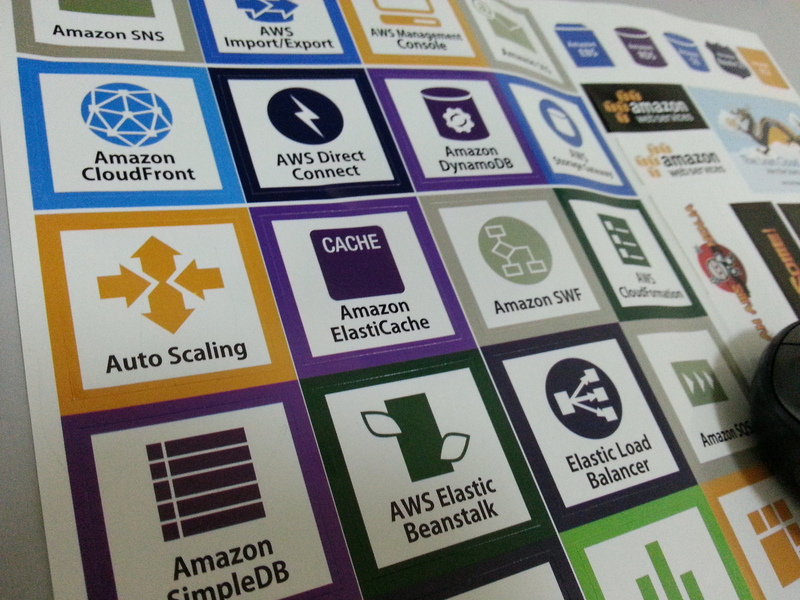 This entry was posted in AWS Cloud, HTML & CSS on July 25, 2015 by admin. After finished the online training on EC2, S3, RDS which I already familiar with, I finally received the remaining USD75 credit thru email from amazon. Many thanks! Sum up with the USD25 free credit that obtain by attending AWSome Day KL in cyberjaya, I accumulated a total of USD100 credit. 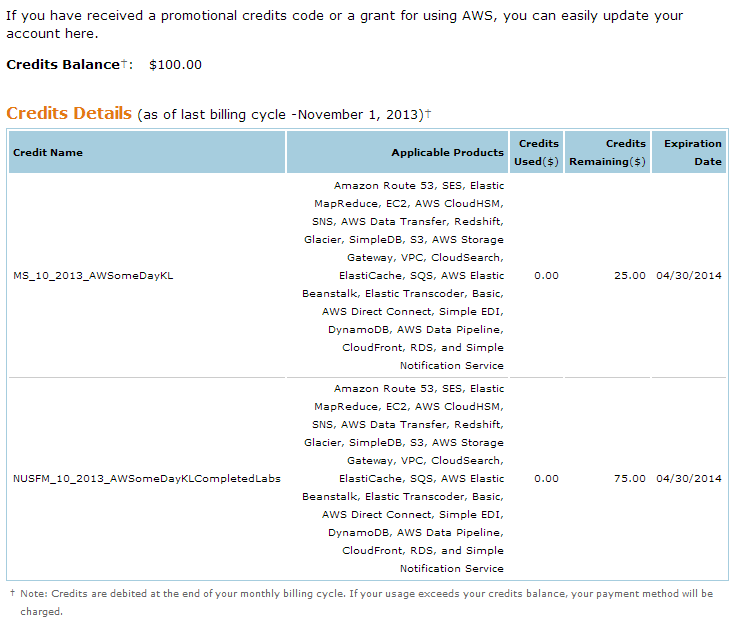 Well, my monthly expenses on AWS is certainly more than this amount but I appreciate this marketing approach. Thanks again to Amazon and I do hope your pricing can keep reducing from time to time as your scale of economy increase. 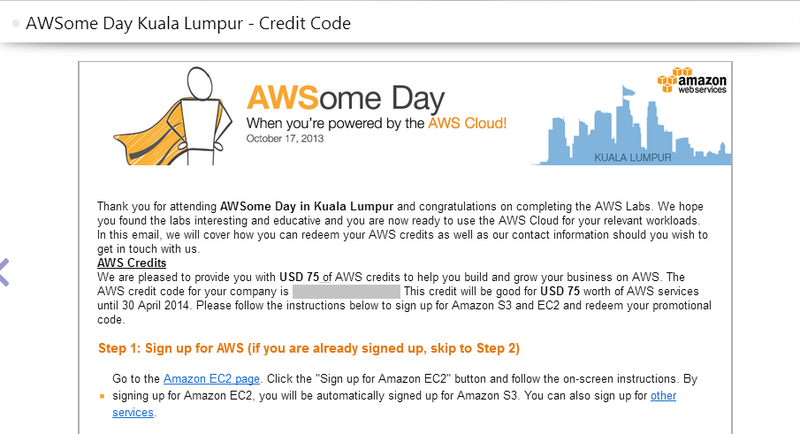 This entry was posted in AWS Cloud on November 29, 2013 by admin. This entry was posted in AWS Cloud, PHP on November 18, 2013 by admin.